Maybe something good is gonna happen. 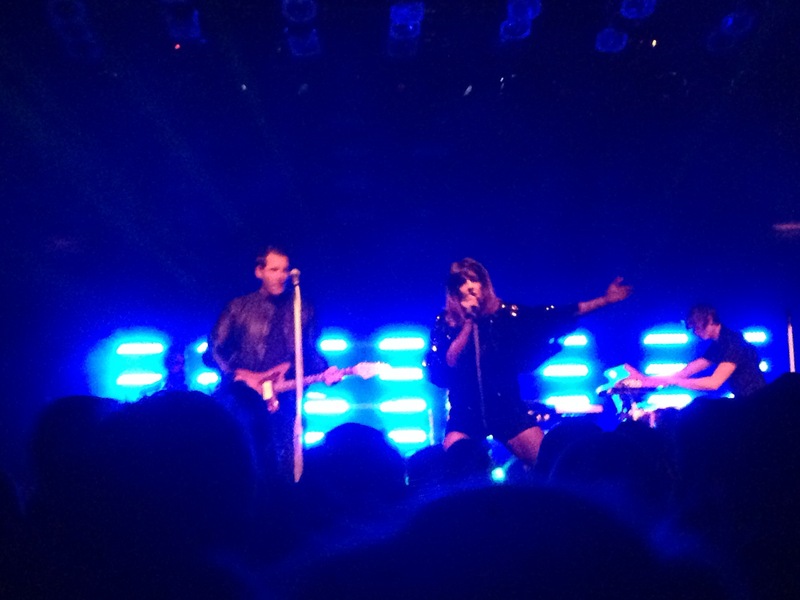 I was just starting to formulate the theme of this “sort-of review,” of my last 27 hours, when Drew and Danielle McTaggart of Dear Rouge sang that line to a sold-out Mod Club in Toronto. And that cemented it. This story starts out back in the spring, when I bought the band’s debut album, Black to Gold. It was love at first listen and I quickly wrote up a list for the blog in tribute to it. The band found my link on Twitter and retweeted it and told me they really enjoyed it. And they followed me. So what’s an intrepid blogger to do with such a fortuitous turn of events? He tries to squeeze more out of it. I asked them for an interview and Drew kindly obliged with awesome, genuine answers. My point is, this band has been, from the start, an endless stream of positivity for me. And positivity seems to be a through line in their lyrics. So let’s suppose for a moment that there’s a mystical element to this life. Where positive thoughts lead to positive forces, which lead to positive chains of events. Yeah, I’m going all “The Secret” up in here. My Dear Rouge blog posts brought into my Twitter feed a certain new follower. I had desperately wanted to go to this show, but financial concerns got the better of me. We just spent a bunch of money on a Disney trip and blah blah blah. About 27 hours before show time I saw a tweet from this follower asking if anyone can use her extra tickets. “How much?” I asked. “Free,” she responded. She had bought tickets, then won another pair from a radio station. She wanted her extra pair to go to a fellow fan. And I turned out to be that lucky fan. Serious happy karma is coming that woman’s way. So there I was, watching Danielle jump on stage to start the show, she and the band back-lit, like silhouettes, as she silently performed some sort of slinky interpretive dance, synths swelling all around her. They played most of the first song, the album’s title track, this way, shrouded in mystery. When the spotlight finally shone on Danielle, a beaming light of manic positivity was revealed. How else do you describe her presence other than joyously manic? Slinking around the stage, dark brown eyes wide open to take in all the love around her, mouth open wide as she gives the love back through her crystal clear, powerful voice. It was all just so positive. And then they sang that line I started this post with, during a song I hadn’t heard before. They sang it over and over again, as though they couldn’t emphasize it enough. And the beauty of that line is that it isn’t blind optimism. To me it suggests the idea that happiness is a decision. You can wake up and decide to think that maybe that day will bring something great into your life. I’m not preaching here. I try to think positively, but it’s hard. There’s a nasty little demon in my brain that just loves to bring me down, to force me to imagine the worst possible results of a given situation. Part of me wants to think that’s a good thing — it keeps me prepared, just in case. And maybe, just maybe, my neuroses fuel my creativity. But I don’t need to dwell on it. Maybe something good is gonna happen. Why not? Then they drove home the message with the most joyous performance of the night, “Best Look Lately.” The lights surged, the band surged, the crowd surged into a singalong frenzy. It was a beautiful moment. 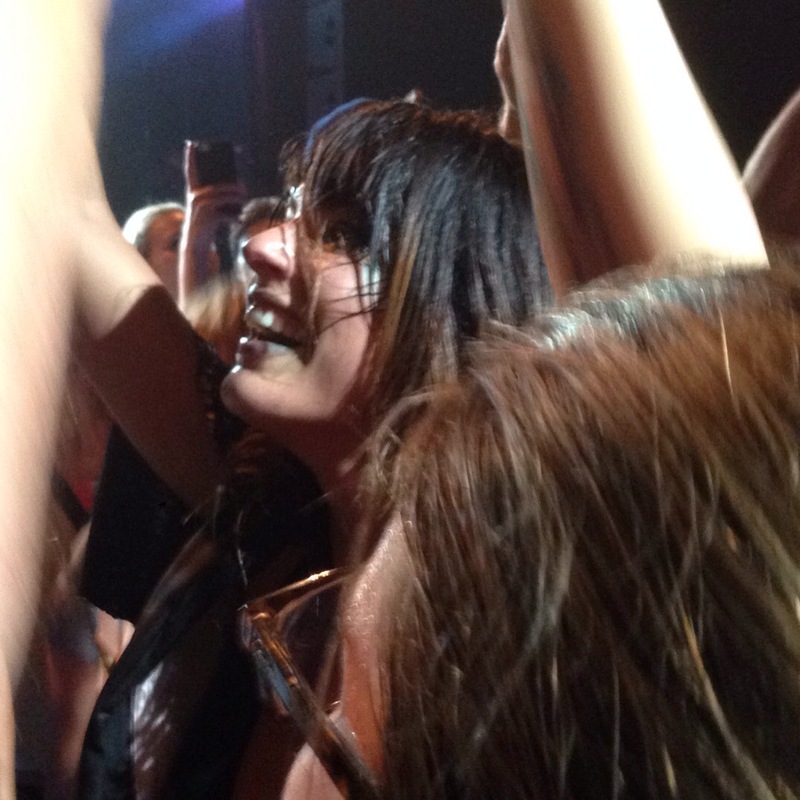 Danielle jumped into the crowd and sang with us for a bit. Danielle seemed genuinely touched by the crowd’s love and the experience of selling out this venue in Toronto, throughout the night. I know, they all say they love you. But she seemed genuine. She wanted to hug us and be friends with us, she said. She even teared up. She opened her arms wide (and her mouth, of course) to bask in it. And there was the lesbian engagement. They invited the young couple on stage and one surprised the other with the proposal. It was another beautiful, genuine moment. In the encore, they treated us to a performance of the gorgeous ballad, “October Second,” which even on record feels so intimate it stops just short of feeling like you shouldn’t be there. Drew got to let his smooth voice shine on that one, too, and Danielle seemed to bask in her husband taking the spotlight for a bit. She gave him a sweet peck on the cheek when they finished. Listen, I know I’m being super sappy here with all this positivity stuff. Some might say naive. But more and more I want to live in a world where this is real, where you can believe that good things are gonna happen, and then they do. And over these past 27 hours, they did.